The Roomy Reptile with a Cool Cache! VITAL STORTISTICS: Accessories: Killer Pizza, Fish Knife, Sewer Slingshot, Shark Fin Hatchet, Bo, Two Ninja Stars Capacity: Fourteen Turtle Tons Favorite Sayi. . . 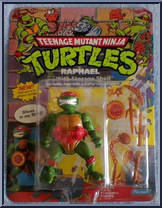 The Roomy Reptile with a Cool Cache! VITAL STORTISTICS: Accessories: Killer Pizza, Fish Knife, Sewer Slingshot, Shark Fin Hatchet, Bo, Two Ninja Stars Capacity: Fourteen Turtle Tons Favorite Saying: . . . The Leader with a Locker! 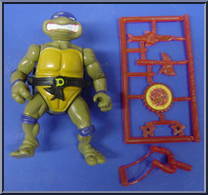 VITAL STORTISTICS: Accessories: Turtle Grappling Hook, Armadillo Club, Pizza Disc, Spiked Knuckle/Climbing Claw, Two Ninja Stars, Two Katana Blades Capacity: Sixteen Turt. . . The Leader with a Locker! 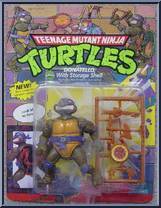 VITAL STORTISTICS: Accessories: Turtle Grappling Hook, Armadillo Club, Pizza Disc, Spiked Knuckle/Climbing Claw, Two Ninja Stars, Two Katana Blades Capacity: Sixteen Turtle . . . 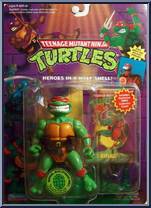 The Hero on a Hinged Half Shell! 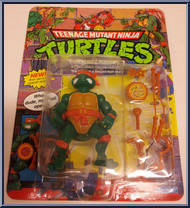 VITAL STORTISTICS: Accessories: Pipe Grappling Hook, Mini-sickle, Snake Bow, Pizza Disc, Two Nunchukus, Two Ninja Stars, Turtle Flashlight Capacity: Fourteen Turtl. . . 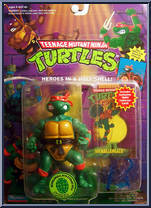 The Hero on a Hinged Half Shell! 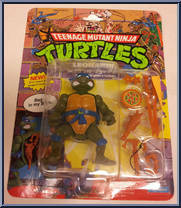 VITAL STORTISTICS: Accessories: Pipe Grappling Hook, Mini-sickle, Snake Bow, Pizza Disc, Two Nunchukus, Two Ninja Stars, Turtle Flashlight Capacity: Fourteen Turtle T. . .
he Turtle teen with a Crafty Compartment! VITAL STORTISTICS: Accessories: Spider Hook, Manta Axe, Two Sais, Blowfish Mace, Ninja-rang, Pizza Disc, Two Ninja Stars Capacity: Fourteen Turtle Tons F. . . 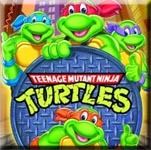 The Turtle teen with a Crafty Compartment! VITAL STORTISTICS: Accessories: Spider Hook, Manta Axe, Two Sais, Blowfish Mace, Ninja-rang, Pizza Disc, Two Ninja Stars Capacity: Fourteen Turtle Tons Favo. . .